Do you want to learn Spanish language? It’s so simple with this App. Listen and repeat. Audio versions included! 123 Learn Spanish – Everyday Spanish (English – Spanish) includes a phrase book for people willing to learn the basics of Spanish language. 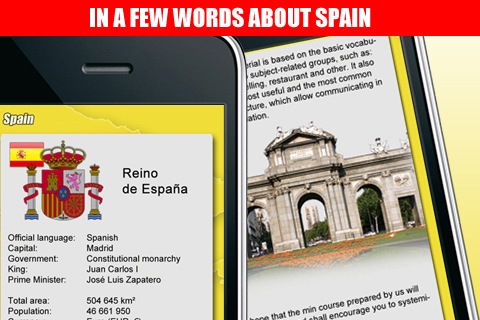 The phrase book is mainly for people, who don’t speak Spanish but it may also be useful for people, who have come across Spanish language already. Everyday Spanish contains questions, answers, words and phrases, which allow communicating in standard situations associated with travel and living abroad and may be used as language basics aids as well as in some standard, specific situations. All phrases and words are in audio version (English and Spanish) so it’s easy to learn correct pronunciation immediately. 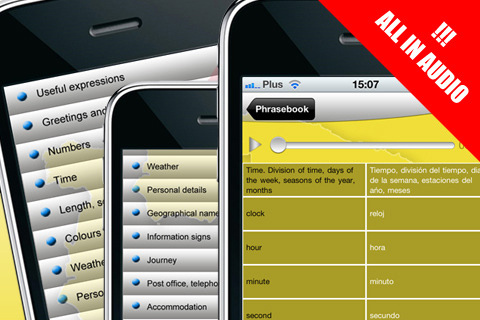 This application also includes the most useful and the most common grammar structure, which allow communicating in a specific situation. We hope that the mini-course will be very useful and shall encourage you to systemically learn the language.